The city of Barcelona has tons of things to offer and many beautiful monuments that will contribute to make your trip unforgettable. There are lots of beautiful neighbourhoods and places worth exploring, but you can't miss out on the most famous and impressive attractions of the city. Here you have GowithOh's top 10 'must see' sights of Barcelona so you can add them to your to-do list! Besides, remember that you can find apartment options near all of them! The Sagrada Familia is the most famous cathedral of Barcelona, and probably one of the most famous in the world. It may not be the largest or the oldest -as you probably know, it's still under construction-, but it is definitely the most unique. The locals take pride in this impressive monument of the architectural style known as Modernisme, which is an essential part of Barcelona's identity. The Sagrada Familia, inspired in nature and with a beautiful mixture of styles, will surely be one of the sights of Barcelona that you will never forget. Every major city has its own majestic avenue, and Passeig de Gràcia is Barcelona's own one. This wide, charming avenue is full of life, shops and restaurants, and it is also full of important monuments. There, you will be able to see architect Antoni Gaudí's two most famous houses, as well as other important monuments of the architectural style known as Modernisme. 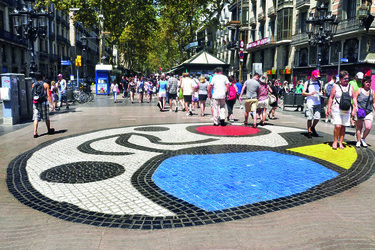 Passeig de Gràcia guarantees culture and entertainment, as well as an important passage from the city centre to charming neighbourhoods located in the upper side of Barcelona, such as Gràcia. Another of Barcelona's proudest assets is its football team, the internationally famous FC Barcelona, popularly known as Barça. 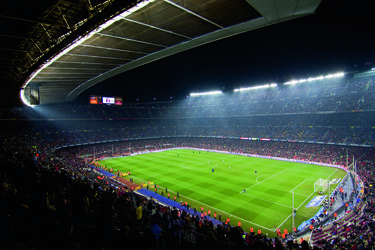 Football fans around the world will enjoy visiting its impressive stadium, the Camp Now, as well as the Barça Museum located there. The luckiest afficionados may even be able to enjoy a football match in Camp Now and witness a victory by the local football team. Tradition says the victory will be celebrated in the Canaletes fountain located in Las Ramblas, so don't forget to join the street party afterwards! 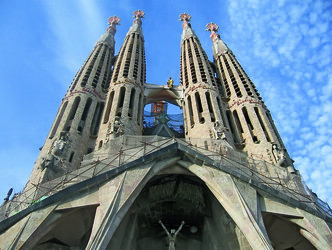 The Sagrada Familia is the most famous work by Catalan architect Antoni Gaudí, but not the only one. 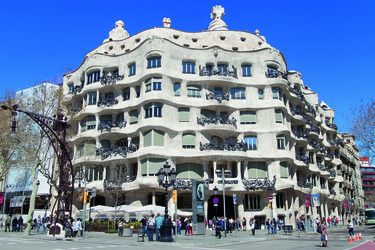 In Passeig de Gràcia, you will be able to see two of the houses he designed. 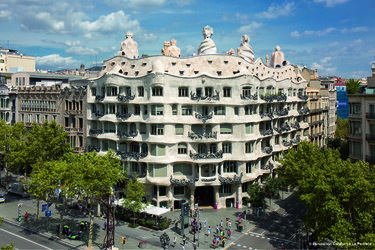 One of them is the Casa Milà, popularly known as La Pedrera, which was built between 1906 and 1910. The façade of La Pedrera shows Gaudí's naturalistic period and it is an astoundingly beautiful sight, but you can see much more than that. If you decide to visit the building, you will be able to enjoy the views from the terrace and the exhibitions inside. The Casa Batlló is one of the most impressive sights of the majestic avenue of Passeig de Gràcia. After the Sagrada Familia, it is the most famous work by architect Antoni Gaudí. Built between 1904 and 1906, its impressive and colourful façade is considered by many an allegory of Carnival -which can be seen in the balconies shaped as Carnival masks-, and many others are reminded of other shapes and see, for instance, a dragon in its roof. The interior and the furniture were designed in the same style, so it is one of the most recommended visits of the city of Barcelona. One of the first things you will visit in the beautiful city of Barcelona is the charming and always crowded avenue of Las Ramblas, the promenade located in the city centre that communicates Plaça Catalunya with the Port Vell. It's covered by canopies of trees and populated by human figures and historical news-stands and other shops, and it's equipped with tons of restaurants (be careful, though! Many of them are tourist traps) and attractions at one side and the other. One of them is the famous market of La Boqueria. At one side of Las Ramblas, in the city centre of Barcelona, you will find the Gothic Quarter, one of the most beautiful and charming neighbourhoods of the city. 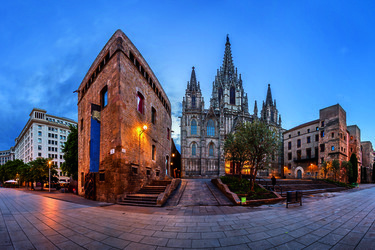 The Gothic Quarter includes monuments such as the Barcelona Cathedral or Plaça Sant Felip Neri, and hides an important part of its history and its past. Go on a tour to learn all the secrets hidden there, get lost in the ocre twisted streets or shop in its unique boutiques Once you get lost in the charm of the Gothic Quarter you won't ever want to leave! 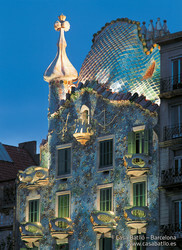 We have architect Antoni Gaudí to thank for many of Barcelona's attractions. 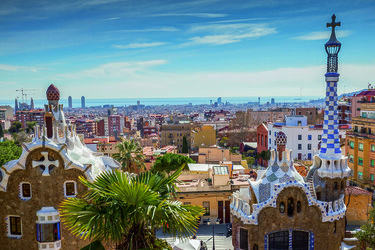 The Park Güell is one of the most famous. There, visitors can enjoy the beauty of Gaudí's designs as well the views of the city from the top of the hill of the Three Crosses. The Park Güell includes many beautiful monuments and promenades, and it is carefully designed with different atmospheres from top to bottom. Don't miss out on the opportunity of taking a picture next to the famous dragon, a perfect example of the trencadís, a colourful technique invented by Gaudí. 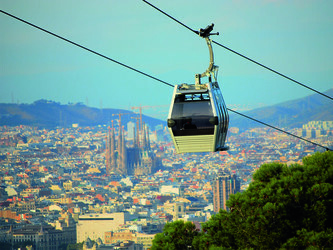 The more you discover of Barcelona, the more you realise that there are tons of things to do in there! The mountain of Monjuic is a good example of the many gems hidden in the city. You may go there to see the palace or the castle (yes, you will find both! ), but then you will discover the gardens, and the beautiful cemetery that climbs down the mountainside, as well as the museums and the Olympic Stadiums. You can enjoy the views of the city from the top of the mountain, and you can do so from the funicular too! 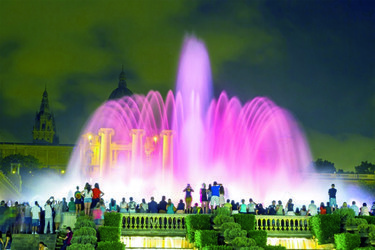 The mountain of Montjuic has a wide cultural offer, as well as nature and entertainment, so you can easily spend a whole day or an afternoon there and put the cherry on top with the impressive Magic Fountain of Montjuic. At night, the Magic Fountain offers a wonderful spectacle of water, music and lights, with streams of water that jump to the sky to the rhythm of classical and modern music. All of it, embellished with colourful lights that change along the show. A perfect way to end your day!